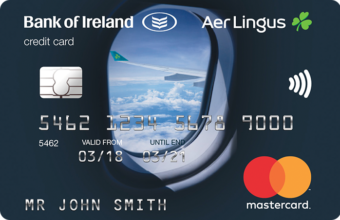 Bank of Ireland and Aer Lingus have teamed up to bring you a new kind of credit card. One that turns your spend into amazing travel rewards. Let the adventures begin! Apply online in minutes, call us on 0818 200 412 - Monday to Friday, 8am - 8pm or visit your local branch. Note the product you are looking for? 2 Fast Track & Priority Boarding Passes: on Aer Lingus operated flights out of Ireland at selected airports every Reward Year. Your Fast Track pass will minimise any waiting time and gets you through security in no time. With priority boarding you can enjoy being one of the first on-board to store your cabin bag and relax in your seat before take-off. 2 Lounge Passes: to access airport lounges at Dublin, Cork, Shannon and Belfast every Reward Year. Relax and unwind before your flight in the comfortable surroundings of the lounge with free Wi–Fi, complimentary drinks and snacks, and a range of newspapers for you to browse. Low cost instalment option: Spread the cost of larger purchases at a great low rate by taking advantage of our unique credit card Instalment Plan. Find out more. Free Additional Cardholders: Add up to 3 additional cardholders and still pay government stamp duty only once. NOTE: JOIN AERCLUB & LINK Once you’re approved you’ll need to join AerClub, the loyalty programme of Aer Lingus and then link your Aer Credit Card with your AerClub account to unlock your travel rewards. It’s really important you do this. *Cost of purchasing Fast Passes (€5.95 per pass x 2), Lounge Access (€30 per access x 2 ) and Travel Insurance (€157.79 per policy) equates to €229.69 (€19pm). Free Fares and Avios are not included in price comparison. Fast Pass Source: Find Out More Lounge Pass Source: Find Out More Worldwide Multi Trip Travel Insurance: €157.79 per policy p.a. Bank of Ireland Annual Multi Trip Silver worldwide travel insurance online quote based on family for two adults aged between 18-49 with no children. This information was obtained in February 2019. Bank of Ireland takes no responsibility for the accuracy of information from third party websites. Aer Credit Card is brought to you by Bank of Ireland in partnership with Aer Lingus. Over 18s only. Lending criteria, terms and conditions apply. Subject to a monthly fee of €7.99. Bank of Ireland is regulated by the Central Bank of Ireland. Taxes, fees and charges apply. Available when you spend €5,000 or more within a Reward Year on the Aer Credit Card, except for Excluded Transactions. Free return fares are for any European Aer Lingus ticketed and operated flights to / from Dublin, Cork, Shannon or Belfast. A minimum of two seats per flight will be available, except for Restricted Periods. Seat availability on the Aer Lingus website or through a booking agent does not guarantee a free return fare. Acceptance criteria, terms and conditions apply. Bank of Ireland Travel Insurance is underwritten by AIG Europe Limited.